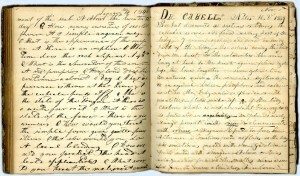 Student Notebook of Jethro Meriwether Hurt, 1839-1840. 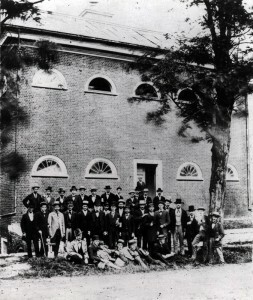 Hurt attended the University of Virginia for the 1839-40 session. 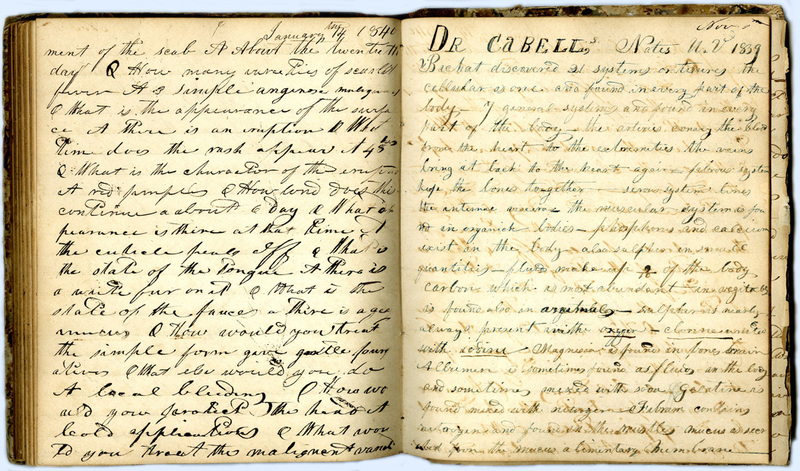 See the top of the right hand page which refers to Dr. James L. Cabell, the Virginia anatomy professor at the time. Hurt graduated from the University of Pennsylvania Medical School in 1841. University of Virginia Student Notebook Collection, Box 16, Folder 1, Historical Collections, Claude Moore Health Sciences Library, Charlottesville, Va. In the 1820s, students in the medicine and anatomy & surgery classes numbered in the teens or twenties. Totals fluctuated in the 1830s and 40s up to 61 students. The increase in students interested in studying medicine and anatomy meant that capacity issues had to be addressed by not only making the best utilization of available space, but also by adding new space. Minutes from the next year’s meeting make it clear that not all these modifications had occurred as it was resolved, “That the Authority given to the Executive Committee at the last annual meeting of the Visitors to exchange the lecture and dissecting rooms at the Anatomical Theatre and to make alterations in those apartments having reference to such exchange be and the same is hereby revoked.”  Nevertheless, these minutes, dated less than six years after the opening of the University of Virginia, indicate that there was a substantial, functional basement, not just a charnel on the lower level as indicated in Thomas Jefferson’s design. Stiff Hall, 1910. This photo shows the original south wing with the cupola as well as an attached north wing built in the 1880s. After the new School of Medicine opened in 1929, this building was used for the Extension Division, a precursor to the School of Continuing and Professional Studies. It was torn down for the ground-breaking of Newcomb Hall in 1956. Prints20654, Special Collections, University of Virginia Library, Charlottesville, Va. It appears that another structure was built following a Board resolution in 1837 that permitted a “suitable dissecting room for the classes in Anatomy, to be erected in a suitable situation in the rear of the Anatomical Theatre together with a suitable vault attached to the same.”  It was variously called the Dissecting Hall or the Anatomical Laboratory, as well as Stiff Hall by the students. It had dissecting tables, a vat with a solution to preserve the subjects, and a pit in the cellar for the disposal of unwanted remnants of the subjects. This new building to the west of the Anatomical Theatre reduced the space pressure on the Theatre, in addition to removing some of the unsavory dissection further from the main teaching and residential areas of the University. Detail of the Anatomical Theatre from View of the University … by E. Sachse & Co., 1856. 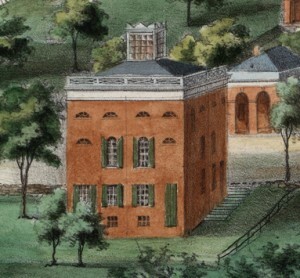 A cupola was not part of Jefferson’s design. It was probably added after the 1837 resolution to raise the roof. This image clearly shows the cupola was present in 1856. Special Collections, University of Virginia Library, Charlottesville, Va. In 1837, a resolution was made to raise the roof of the Theatre and cover it with slates. The original roof with its skylight likely leaked as did so many of the early University buildings. It is possible the first roof was removed, but it is more likely that a second roof with a pitch was added over the first. 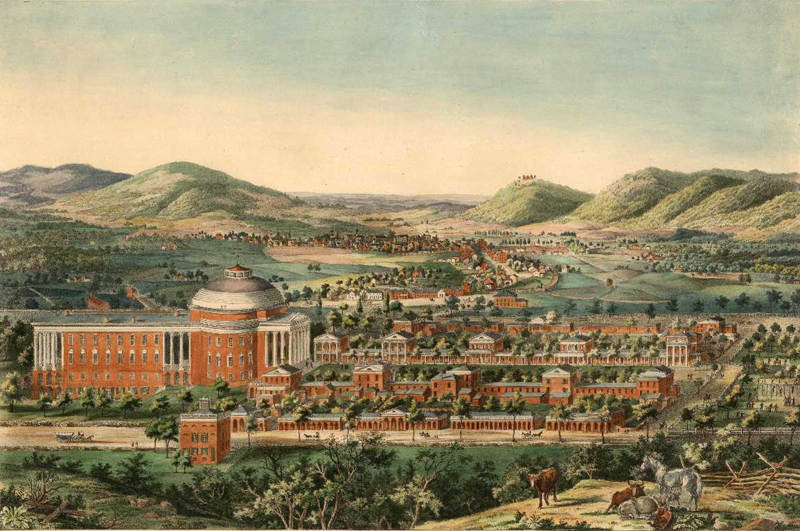 Either way, Edward Sachse’s View of the University, Charlottesville & Monticello, taken from Lewis Mountain clearly shows that the cupola, absent in Jefferson’s original design, was present in 1856. It seems reasonable that the cupola was added when the new roof was installed. With its many panes of glass it would have functioned as a lantern during the day by sending shafts of light into the top floor of the Theatre. Also in 1837, Dr. Augustus Warner, who had earlier waged a spirited battle for the use of the University wagon and horse to carry cadavers for dissection, suggested various improvements needed at the Anatomical Theatre. As a result, it was resolved to remove the brick pavement and vault that were constructed in front of the Theatre to span the space between the building and the road. They were to be replaced with a platform of plank to permit “a free passage of air under neath the platform between the parallel wall supporting the platform in front and the wall of the building.” In a process “recently discovered,” the wood was to have been “kiannized” [kyanized] or soaked in mercuric chloride. This must have been proposed as a way to address the dampness problem referred to in prior years. View of the University, Charlottesville & Monticello, taken from Lewis Mountain by E. Sachse & Co., published by Casimir Bohn, 1856. This shows the relation of the Anatomical Theatre in the left foreground to the rest of the University. 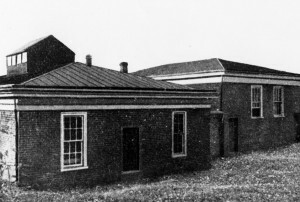 The annex on the back of the Rotunda was added in 1853. Special Collections, University of Virginia Library, Charlottesville, Va. Lighting was understandably an issue for the Anatomical Theatre. In 1843, the Proctor, under the direction of the anatomy professor, Dr. James L. Cabell, was authorized to make an alteration in the lecture room, “by removal of the present partition in the room, so as to admit light from the western window of the story, and by the formation of a new but smaller apartment for the reception of subjects for dissection in the South western angle of the building,” the corner that contained the charnel. This mention of the reception of subjects indicates that some dissection continued to occur in the Anatomical Theatre after the building of the Dissecting Hall in 1837. William Pratt 1858. University of Virginia Maps and Plats, 1856-1869, n.d., Accession # RG-31/1/2:2.532, Special Collections, University of Virginia, Charlottesville, Va. The map to the left shows the University as it was in 1858. 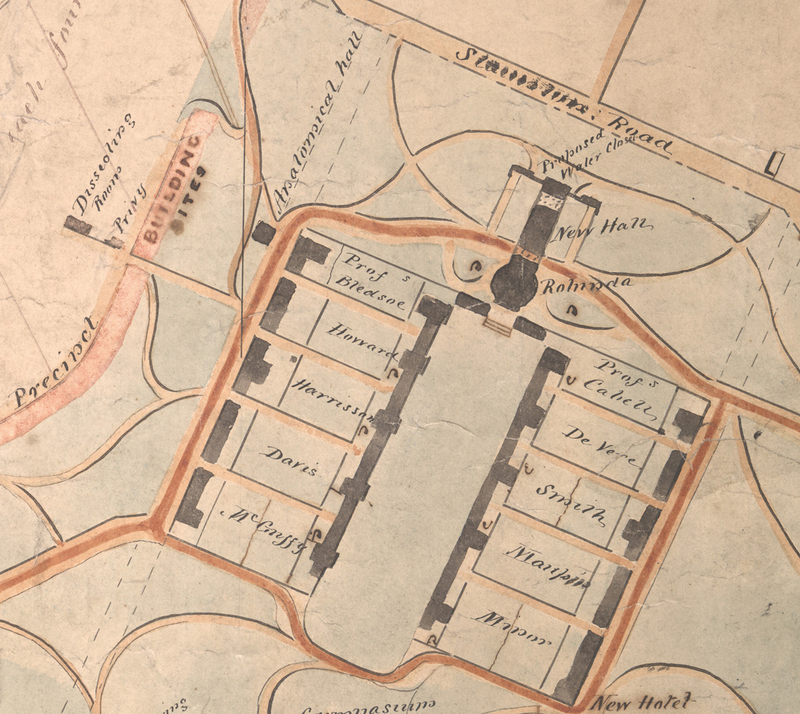 Clicking on it will show a larger version which makes it easier to see the relative placement of the Dissecting Rooms, also called Stiff Hall, and the Anatomical Hall or Theatre. Both are in the upper left quadrant. The pavilions are labeled with the names of the resident professors. Dr. Davis lived on the west side and Dr. Cabell on the east. The Rotunda is to the north of the pavilions and is connected to the New Hall, which was added in 1853. Later known as the Annex, it burned down in 1895. Beauchêne Skull. 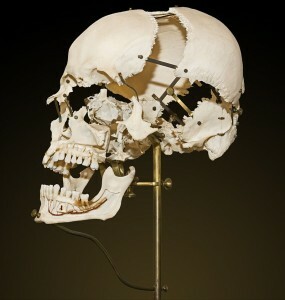 The Beauchêne skull is also called an exploded skull. Wikimedia Commons. The medical school purchased anatomical plates and drawings over the years, but either the Dissecting Hall or the Anatomical Theatre was home to a work of art by an unknown illustrator. Writing about his experience in the School of Medicine in 1876-1877 when he was a student, Dr. Paul Barringer described a mural that faded over time. “In those days a great mural adorned the walls of the dissecting room. Nearly always there were one or more ‘academs’ in anatomy, artists or others after the artistic approach to the human figure, and one of these had drawn in permanent crayon a most surprising scene. The dissecting hall had been built fifty years earlier, and at the back end was a bricklined pit, some thirty or forty feet deep, into which was thrown all anatomical waste—particularly the bodies carved up in ‘surgery on the cadaver,’ along with many other fragments, for only the most stalwart bodies were boiled to make proper material for the work in osteology. Anatomical Theatre with the Class of 1873. 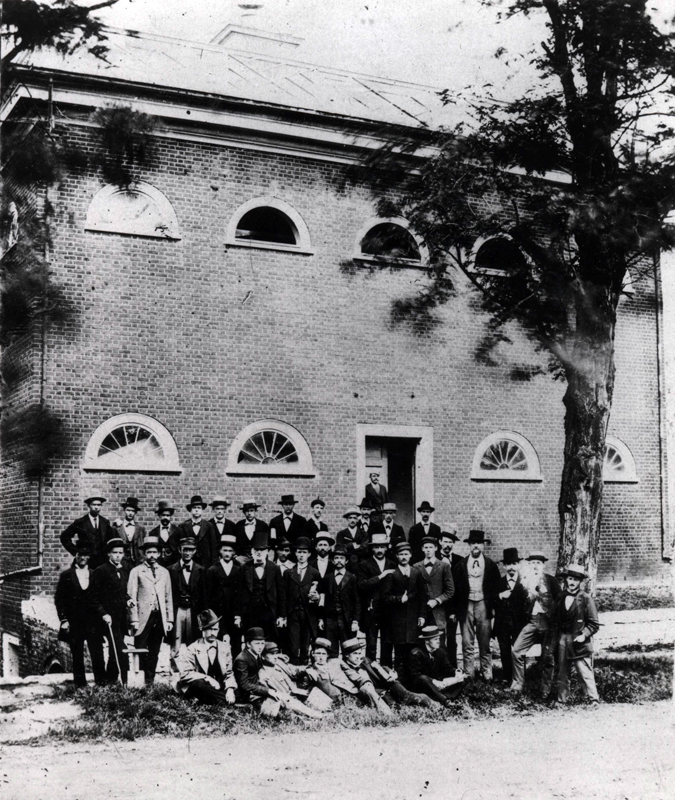 The class is standing in front of the Anatomical Theatre. The cupola, probably added after the 1837 resolution to raise the roof, is barely visible at the top of the building. Prints07390, Special Collections, University of Virginia Library, Charlottesville, Va.
University of Virginia, Board of Visitors. Minutes, June 28, 1850, 171, Retrieved from http://guides.lib.virginia.edu/bovminutes. Penn Medical Students: compiled from the January 1841 University Catalog. Retrieved from http://www.archives.upenn.edu/people/students/med/catalogs/catmedmat1841.html. University of Virginia. Catalogue of the Officers and Students of the University of Virginia, 1825-26 through 1846-47. Robley Dunglison to Arthur S. Brockenbrough, September 8, 1826. Papers of the Proctor of the University of Virginia, Box 6: Folder 655. RG-5/3/1.111, Special Collections, University of Virginia Library, Charlottesville, Va. The Demonstrator of Anatomy in 1927 was Dr. Thomas Johnson. He advanced to become a full professor in anatomy in 1832 and resigned in 1834. Blanton, Wyndham Bolling. Medicine in Virginia in the Nineteenth Century. Richmond: Garrett & Massie, 1933, 22. University of Virginia, Board of Visitors. Minutes, July 30, 1830, 28-29. University of Virginia, Board of Visitors. Minutes, July 11, 1831, 63. University of Virginia, Board of Visitors. Minutes, July 11, 1831, 63-64. University of Virginia, Board of Visitors. Minutes, July 10, 1833, 92. University of Virginia, Board of Visitors. Minutes, July 11, 1831, 63, 66. University of Virginia, Board of Visitors. Minutes, July 10, 1833, 92 and July 4, 1843, 73. Journals of the Chairman of the Faculty 1827-1864, April 5, 1833, Box 1: Volume 4. RG-19/1/2.041, Special Collections, University of Virginia Library, Charlottesville, Va.
Journals of the Chairman of the Faculty 1827-1864, May 14 1833, Box 1: Volume 4. University of Virginia, Board of Visitors. Minutes, August 17, 1837, 5. Barringer, Paul B., James M. Garnett and Rosewell Page, (Eds.). University of Virginia, Its History, Influence, Equipment and Characteristics. New York: Lewis Publishing Co., 1904, 109-110. Fitz-Hugh, 2; “100 Years of Partnership.” Columns: News from the School of Continuing & Professional Studies (Spring 2015) Retrieved from http://www.scps.virginia.edu/columns/view/100-years-of-partnership-Spring-2015. University of Virginia, Board of Visitors. Minutes, July 4, 1840, 47. University of Virginia, Board of Visitors. Minutes, August 17, 1837, 4. University of Virginia, Board of Visitors. Minutes, July 4, 1843, 73. University of Virginia, Board of Visitors. Minutes, June 28, 1850, 171. University of Virginia, Board of Visitors. Minutes, August 17, 1837, 4-5; University of Virginia. Catalogue of the Officers and Students of the University of Virginia, Session of 1842-1843. Richmond: Shepherd and Colin, 1843, 22. University of Virginia, Board of Visitors. Minutes, August 17, 1837, 6. University of Virginia, Board of Visitors. Minutes, June 25, 1848, 138. A.E. Peticolas to J.S. Davis, January 30, 1856. Papers of John Staige Davis, 1839-1885, Box 1: Folder “Correspondence of John Staige Davis, Sr., 1851-1858.” MSS 3247, Special Collections, University of Virginia Library, Charlottesville, Va.
Barringer, Paul B., James M. Garnett and Rosewell Page, (Eds. ), 160. Inventory of the Department of Anatomy, the Department of Materia Medica, and the Department of Botany & Vegetable Physiology, June 23, 1859. Papers of John Staige Davis, 1840-1888, Box 3: Letterpress book. MSS 1912, 2842, Special Collections, University of Virginia Library, Charlottesville, Va.
Barringer, Paul B. The Natural Bent. Chapel Hill: The University of North Carolina Press, 1949, 221-222.